The working-class folks, immigrants and diverse communities that built this city are dying under the weight of tech capitalism. Infused with a false utopian ideology of “world-changing,” orbited by buzzwords like “innovation” and “disruptors,” these neo-imperialists are obtuse, wealthy, and totally brainwashed. Like a retrovirus, they’re willing to mutate their speech and dialogue to make it sound like they’re doing good even while they’re evicting us and kicking us to the curb. But they won’t win. They can’t. The city is built on the backs of working people; if the bus drivers, electricians, plumbers, drivers, teachers, nurses, construction workers, bussers and waiters stopped coming to work, this city would collapse. If the financiers stopped going to their work, no one would notice the difference. We can recover our humanity by making them notice us. They evicted us; why not evict them? New “innovations” in drone technology and targeted demolitions can allow us to take out our oppressors. Planned detonations in Silicon Valley—in Atherton, Woodside, Cupertino, Mountain View, Wall Street and Palo Alto—will stave off the capitalist cancer. 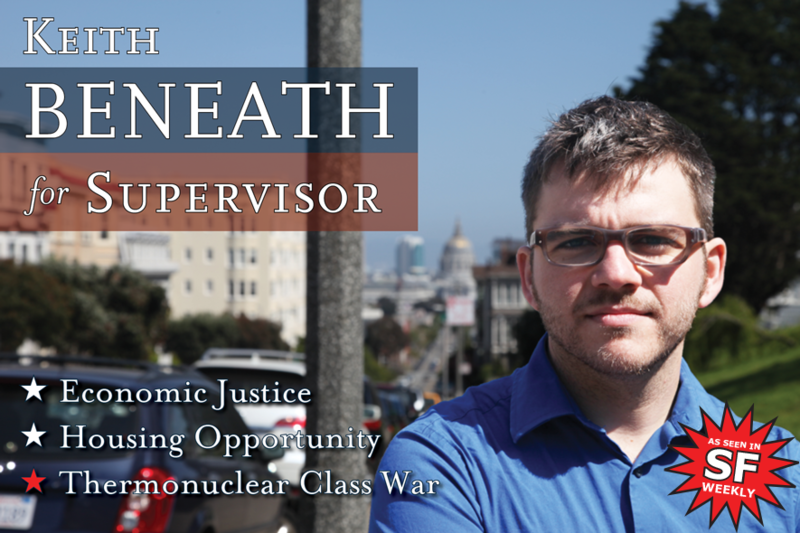 Only one candidate for City Supervisor is talking openly and honestly about revolt, proletarian revolution, and carpet-bombing the South Bay: Keith Beneath. He’s running against hippie-bully Scott Wiener, anti-nudist and political tool of the tech infection. In the end, who is going to stand up for you and destroy the men holding the key to your chains? Keith Beneath, held up by the people he fights for.